Bicycling to work, to school, to the store or even to a show in University Park is not only a great way to go green, it can be fun! As part of Akron Bicycle Week, University Park Alliance (UPA), The University of Akron Bike Club and the City of Akron are sponsoring two great events in University Park on Sunday Sept. 6 for residents, students and visitors with a keen sense of fun. Part road race, part scavenger hunt, cyclists will take to the streets of University Park for a rousing good time in the second annual "Amazing Race" style Crank UP! Bicycle Scavenger Hunt. Two groups of cyclists will race for a chance to win exceptional prizes. A long race will be offered for more adventurous cyclists, while those who prefer a more leisurely ride can choose a shorter race. Both races start at 4 p.m. at the University Park Cycle Shop, 160 Exchange St. in Akron and will conclude at University Park's Grace Park for the Crank UP! After Party. Race tickets can be purchased for $5 in advance or $7 the day of the race at University Park Cycle Shop. Bikes are available for rental through the University Park Bicycle Shop. Helmets are required to race. Participants must be 18 or older and provide a driver's license to ride. Crank UP! 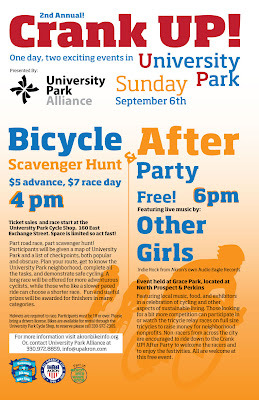 After Party Featuring a Free Concert by "Other Girls"
Organized by The University of Akron Cycle Club, the FREE Crank UP! After Party will feature the tight power pop of Audio Eagle Records artists "Other Girls," as well as food and exhibitors in a party-in-the-park celebration of cycling and other aspects of sustainable living. Starting at 6 p.m., visitors can check out the displays, listen to the band, eat great local food or just relax at Grace Park, located at the corner of North Prospect and Perkins St. UA student and Greek organizations will have the chance to test their athleticism, knowledge of the University Park neighborhood and especially their ability to withstand public humiliation as they participate in wild and crazy relay races on full-size tricycles to raise money for University Park neighborhood nonprofit organizations. Non-racers from across the city are encouraged to ride down to the Crank UP! After Party to welcome the racers and to enjoy the festivities. For details about these and other Akron Bike Week events, visit www.akronbikeinfo.org, call 330-972-8859 or e-mail info@upakron.com.